Parents still tormented by the need to do better when it comes to the little Scout Elf will have a new secret weapon this holiday season thanks to a creative mom who decided it’s never too early to preserve sanity and get a jump on the naughty Elf. “After a busy day I’d often forget to move my daughter’s elf in the evening or wouldn’t have any new and interesting ‘activities’ for the elf to do while my daughter slept. " The Elf craze has swept the country the last few years. Parents or guardians place one of Santa’s elves in their home as a scout for Santa to find out if they’ve been naughty or nice leading up to Christmas. When the children are asleep, the elf will mysteriously move and get up to all sorts of magical mischief. While kids love it many parents struggle to come up with new ideas for their elf friend each evening. The inspiration for the Mighty Elf Kit came after founder Marianna Clark became increasingly weary of trying to find new and amusing props, places and general capers for her young daughter’s elf to get up after a tiring day at work. Marianna said “After a busy day I’d often forget to move my daughter’s elf in the evening or wouldn’t have any new and interesting ‘activities’ for the elf to do while my daughter slept. The kit contains more than 30 activities with easy to follow instructions, over 10 printed letters and signs plus 4 weekly ‘report cards’ for “The Elf” to fill in. It also has two letters, the first to mark the arrival of Elf and the second saying goodbye with a promise to return next year. The Might Elf Kit is crowdfunding to raise $15,000 to send Elf into production. Early backers can bag a host of great rewards including limited first edition kits and buddy kits for friends and neighbors. To find out more check out the Kickstarter: https://www.kickstarter.com/projects/1396192874/the-mighty-elf-kit-an-off-the-shelf-kit-to-save-yo? The Mighty Elf Kit is the brainchild of Marianna Clark, a working mom who wants to provide an easy and creative solution to getting their children to behave and delight them at the same time. 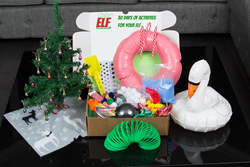 The Mighty Elf Kit will contain 30 days’ worth of props, signs, report cards and letters from the elf that help take the pressure of parents to come up with quirky and fun ideas each evening from Thanksgiving to Christmas day. The team decided to launch the Kickstarter in July, so they can guarantee that each kit will be on the doorstep a week or so before Thanksgiving.